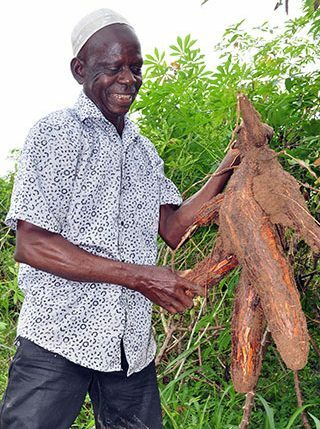 Cassava farmer appreciating his yield. Assessing the impact of crop improvement has been a concern for agricultural researchers as varieties tend to look alike. Improved varieties of cassava, a clonally propagated crop, were mostly disseminated through informal seed systems, making the task of variety tracking difficult. However, researchers from IITA, Michigan State University, and Ghana’s Council for Scientific and Industrial Research-Crop Research Institute, took advantage of rapid advances in DNA sequencing to carry out a pilot study on cassava varietal identification through DNA fingerprinting. This study was conducted in three regions of Ghana covering the largest cassava producing area accounting for 61% of cassava production in the country in 2010. The three study regions were Brong Ahafo, Ashanti, and Eastern. Before 2010, traditional methods such as household survey, morphological descriptors, and expert knowledge were employed in cultivar identification, but these methods were not very reliable. Thus, researchers including Ismail Rabbi, Peter Kulakow, Joseph Manu-Aduening, Ansong Dankyi, James Asibuo, Elizabeth Parkes, Tahirou Abdoulaye, Gezahegn Girma, Melaku Gedil, Punna Ramu, Byron Reyes, and Mywish Maredia took a step further in tracking crop varieties. In carrying out this research, samples were collected from 495 cassava growing households in the three regions and a “library” of improved varieties and landraces maintained by the Crop Research Institute of Ghana. Each accession was genotyped-by-sequencing. Single Nucleotide Polymorphisms (SNPs) were identified. A total of 1045 clones, including 63 “library clones” representing improved varieties and known landraces were genotyped. The accurate cultivar identification and ancestry estimation was accomplished through two complementary clustering methods (distance-based hierarchical clustering and model-based maximum likelihood admixture analysis). The researchers found that 30% of the cassava collected on the farms matched specific released varieties, which is consistent with the results of a prior impact assessment. However, their analysis revealed widespread discrepancies in the names of varieties and landraces. While the farmers provided 180 different variety names for 917 accessions collected, genetic analysis revealed that many were actually the same variety, whereas some accessions with the same name were genetically different. While concluding the study, the researchers affirmed that the traditional methods used to assess the impact of crop improvement are not as reliable as DNA fingerprinting. They therefore advised that the increasingly affordable DNA fingerprinting methods such as Genotyping-By-Sequencing (GBS) should be employed as the primary variety identification tool in agricultural surveys and impact studies, because accurate identification of crop cultivars is crucial in assessing the impact of crop improvement research outputs.